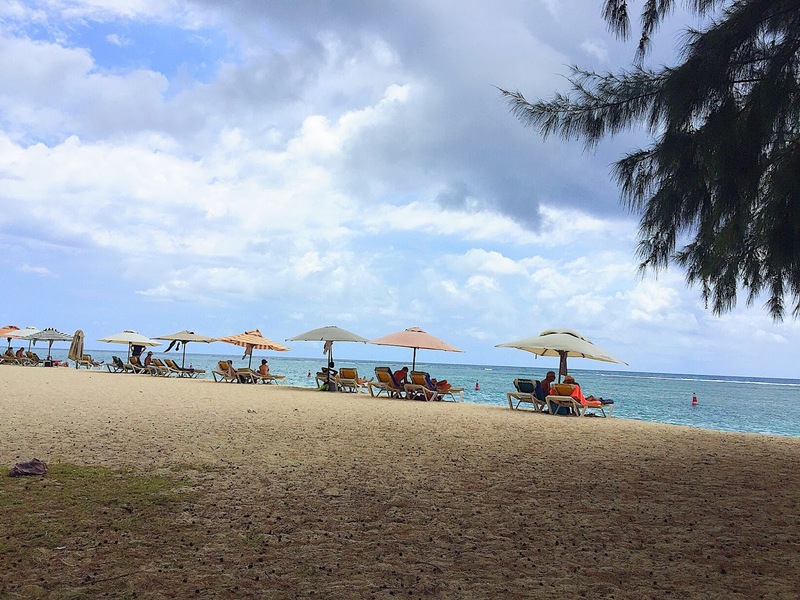 Mauritius 2017 - What to do and eat in Mauritius? Good for the soul! Mark Twain's quote - “Mauritius was made first, and then heaven; and that heaven was copied after Mauritius.” prompted my heart to take a break from Singapore. The only consideration that held me back was that I wasn't too sure if I could make Mauritius my first solo trip overseas - a place that was supposedly near Africa. Usually one would pick Bali? I don't know. Through a series of fortunate events, everything was made smooth. I felt at that moment, heaven has opened a window to let some fresh air in. A vacation that truly belongs to me! Before I went, I read up on Mauritius so that I can have a basic understanding and sometimes this might bring fresh insights when what I read and what I see connect or disconnect. Mauritius is an island in the Indian Ocean, 2000 km away from Africa. Mauritius is around 2040km2 with est 1.3 mil population as compared to Singapore which is around 719km2 with est 6 mil population. Click here to read more. Interestingly, Mauritius has been described as the "Africa's Singapore". Click here to read more. The economy is growing rapidly. Even Mothership.sg has reported the potential and challenges that Mauritius faces. 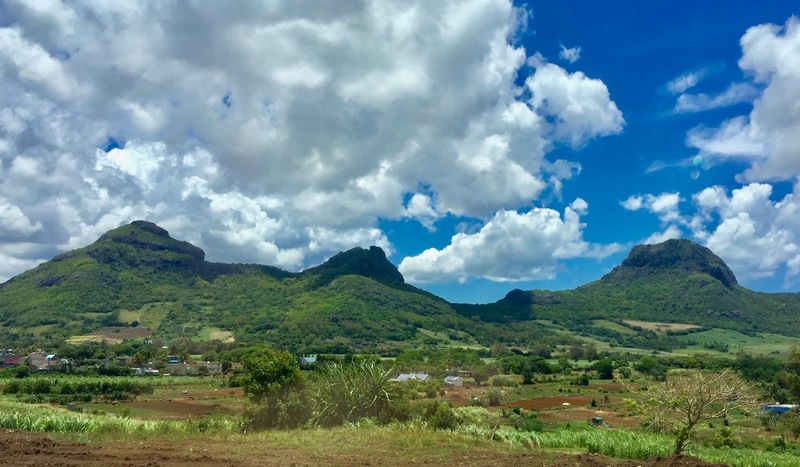 Another interesting fact is that the largest group on Mauritius—about 68% of the population— is Indo-Mauritian, consisting of immigrants from India and their descendants. About 27% of the islanders are Creole (mixed European and African), 3% Sino-Mauritian (Chinese), and 2% Franco-Mauritian. Click here to read more. I was away from Singapore for 8 days. As it was a late flight, I was only in Mauritius for 7 days. Since the last day is usually meant for packing, I was left with only 6 full days. Now, I think it is way too short. Click on the video to view Mauritius 2017 Highlights! I was really happy and felt free. I am not a traveller who needs to tick off all the touristy spots, make my money worth and get myself all tired. A good vacation is one whereby you get recharged, receive fresh insights and enjoy yourself. I was so relaxed that I could poop the very next day of arrival. Sometimes, I get constipation when I travel. Do you? I love travelling because I get to see a different culture and sometimes, that might make me a better person. Mauritians speak Creole, French and English fluently. I like the sound of the Creole language. I was mesmerised when I see Mauritians speaking Creole and it sounded very polite, jovial and warm. 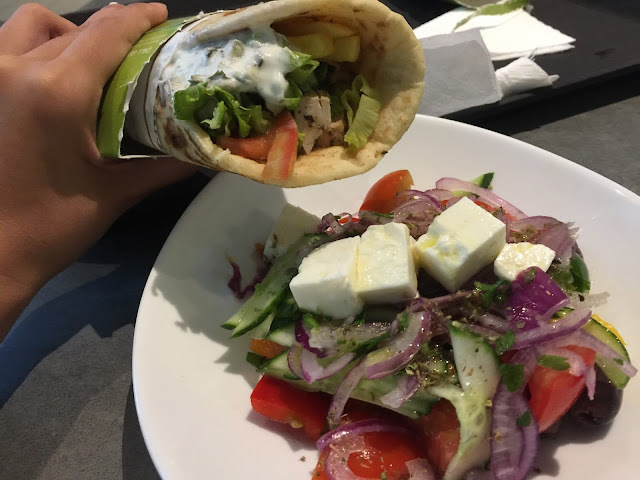 So, what are some of the amazing stuff you can consider doing if you are a traveller like me? Flic en Flac beach is located in Black River on the Western Coast of Mauritius. Click here to read more. You can catch the sunset, watch the sun go down the horizon, painting the sky in beautiful hues. It was breathtaking! I was happy that my first sunset was that beautiful. Touristy websites always portray Mauritius to have white beaches with clear water. It is true! The brilliant turquoise is awesome. I saw the turquoise water at the beaches in the North. Someone once enlightened me that the colour of the sea is affected by reflection. Click here to read more for Science geeks. It is also worth mentioning that Mauritians enjoy their beaches. It is a common sight to see locals unwinding at the beaches during weekends. Flic en Flac beach has a line of sheltered rest areas for beach goers to just chill. They were extremely popular so I suggest that you bring your own mat if you want to take a nap while the sound of the waves lull you to sleep. It also has no lack of food. It has food trucks and a row of restaurants for you to choose from. Other than the beach itself, I also liked the food trucks. I had two soft serves - one was nicer than the other. Good luck! Both melted at an alarming rate. It was a messy affair that I enjoyed. Who could resist licking a soft serve cone, relaxing on the bench and enjoying the sea view. Lovely! I love my road trips to the West, North and South of Mauritius. I saw awesome sights and was drenched with euphoria. Another reason was that road trips enabled me to see Mauritius in the short amount of time I had. I saw towns, villages, different types of beaches, houses and a strong agriculture of growing sugar canes. I was also very attracted to the rows of Flamboyant trees. There is also something exhilarating about driving, listening to music and enjoying a good view. I listened to many songs throughout the long drives and two of them were my favourites - Firestone and Fragile produced by Kygo. The lyrics were awesome. Click here for Firestone. Click here for Fragile. If you are taking a road trip, do stop by Gris Gris which is well-known for its sea cliff. It is one of the more spectacular sights that I enjoyed on my trip because it gave me a similar sense of awe when I went on a mountainous trek just to behold a spectacular sight in New Zealand. The sound of the waves crashing violently against the cliffs helped tune out all distractions. I suggest you find a nice bench and spend some time just watching the waves and enjoying the very strong breeze. For nature lovers, you can check this website out. 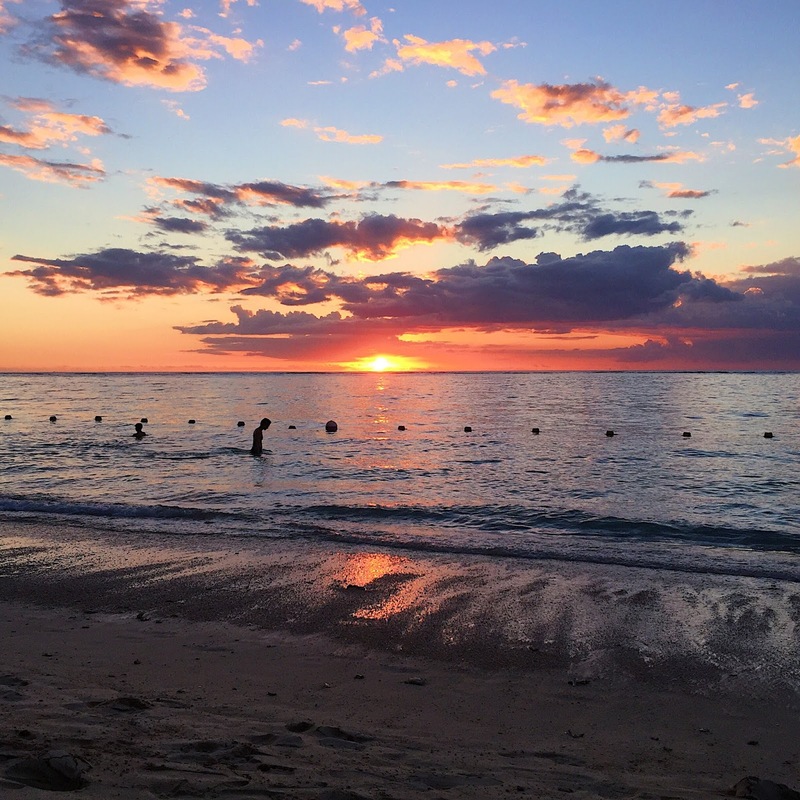 For beach hoppers, this website is great as it covers the different beaches in Mauritius. Enjoy the sight of Flamboyant Trees. Flamboyant trees are also known as Delonix Regia. The trees blossom from November to January, dressing Mauritius up with its beautiful red petals. When all the trees are blossoming, it is great to take a picture of this park with rows of Flamboyant trees. Check out this website with pictures of Flamboyant trees especially of this park when the trees are in full bloom. 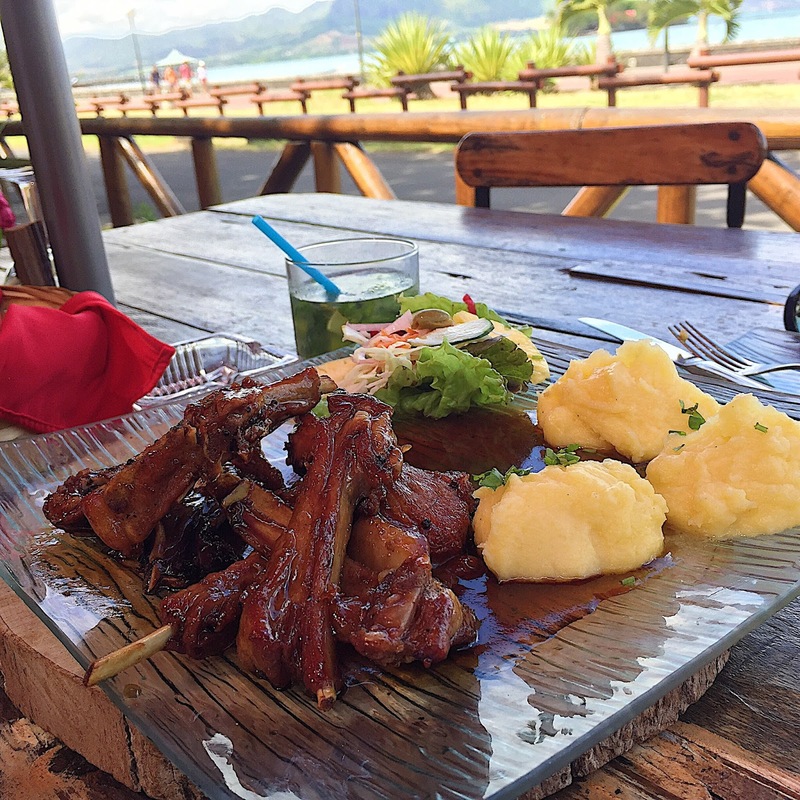 Les Copain d'Abord serves delicious Mauritius Cuisine. It is quite popular and it has around 17000 followers on its Facebook Page. Another compelling reason you should stop by is its amazing waterfront view. It is like a dream come true - to eat and enjoy a good view. Mauritius Cuisine has Indian, French and Chinese influences. Click here to read more about Mauritius food. Wild Boar and venison are featured due to the French hunting traditions. Wild Boar served by Les Copains d'Abord is a Must Try. 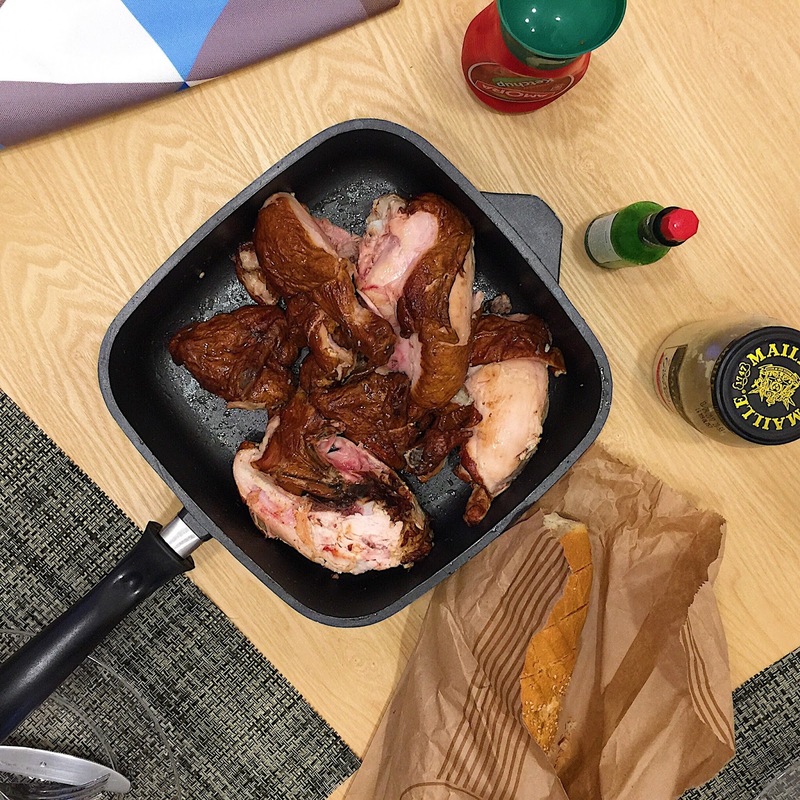 It is the most delicious pork I have ever eaten because it was very juicy, tender, well-marinated and yet retaining the natural sweetness of pork. It did not have any weird porky smell or taste. Perfect! I am still missing it. Curry dominates Mauritius Cuisine. I see a lot of curry dishes and even curry pasta! Curry Squid or Octopus is quite a common dish in a Mauritius restaurant. The Curry Squid by Les Copains d'Abord was fantastic as it had a chewy bite and the squids were very fresh. I also really love the dry curry concept. I especially enjoy being inspired with new ideas for cooking. Lentils Soup is a popular Mauritius dish. It is usually served as a side dish along with a meat dish. I like beans so I find this suitable for my palette. Rum is a huge thing in Mauritius. Mauritians are very proud of their strong agriculture in sugarcane plantations. Rum is made from sugarcane through a process of fermentation. Therefore, this delicious dessert is a Must Try. Flambé means to cover the food with spirits and set alight briefly. I realise that I love Mauritius Rum and I wished that the taste of Rum is this dessert was stronger or it was served with it being lit up with flames. Overall, this was a very good dessert. Les Copains d'Abord also has a comprehensive alcoholic drinks menu. The Mojito was too strong for my liking. Smoked Marlin Heart of Palm Salad is another Mauritius speciality that you must try. Heart of Palm refers to the core harvested from the Palm trees, known to be very nutritious. Marlin is a type of fish and it is considered a huge achievement if you managed to catch it while fishing in Mauritius. The salad was delicious! The texture of smoked Marlin was firmer than smoked Salmon but it was less fishy. The Heart of Palm tasted very crunchy and reminded me of a better version of cauliflower. I was thrilled when I discovered that most of the restaurants sell whole fish in a small portion. All the fish I ate were very fresh - no fishy smell and cooked perfectly. It is rare in Singapore to find small fish cooked whole at western restaurants. The dips were awesome - butter sauce and mayo. If you happen to visit Flic en Flac beach located on the West Coast of Mauritius, I highly recommend Le Bougainville because not only was the food delicious, the ambience was awesome with cosy lighting and tasteful decor. Enjoy a glass of Mauritius Flavoured Rhum. Mauritius is very famous for its rhum production. There are many day tours that will take you through the rhum production. You can also make your own flavoured Rhum at home. Check out this recipe online. There was a nice warm sensation running through my body as I drank the rhum. I like it because it was sweetened with fruits and vanilla sticks. The fruit itself tasted like the plum in Choya. Roti definitely reminds me of Prata. Mauritius Roti is softer and the taste is not as doughy. The Roti that I had were delicious as they were wrapped with fillings such as fish, beef, mutton and chicken cooked in curry. It is such a fantastic idea that I thought Singapore should revamp their Roti Prata. You can also try Alouda - a local drink that tasted like sweetened milk. It was quite nice but I would take my coffee any time over that. 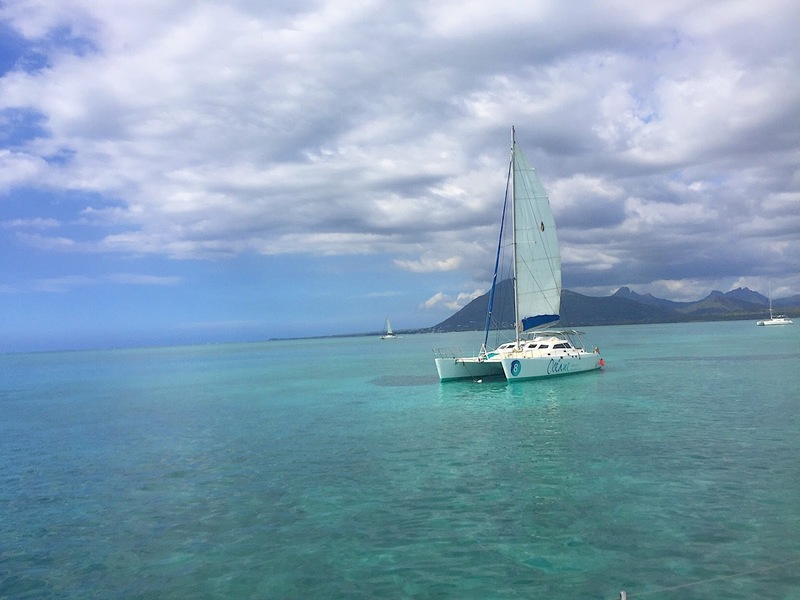 In case you are wondering if Mauritius is all about curry, roti and rhum, you are wrong! Mauritius has a variety of cuisines and no lack of nice cafes. I went to Artisan Coffee located at Cascavelle Shopping Mall in Black River for breakfast. The decor was very retro and cheery. The coffee was good. A good coffee smells lovely and needs to give me this warm and fuzzy feeling. 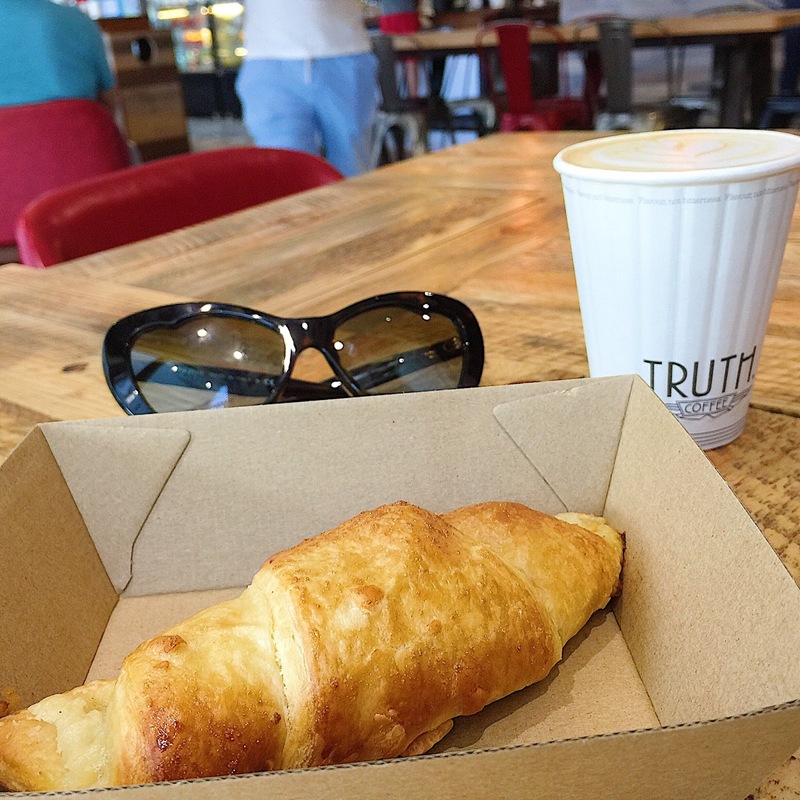 What does it mean when a cafe claims that it sells artisan coffee? It means that it pays special attention to the selection of ingredients and brewing process to ensure a quality brew. 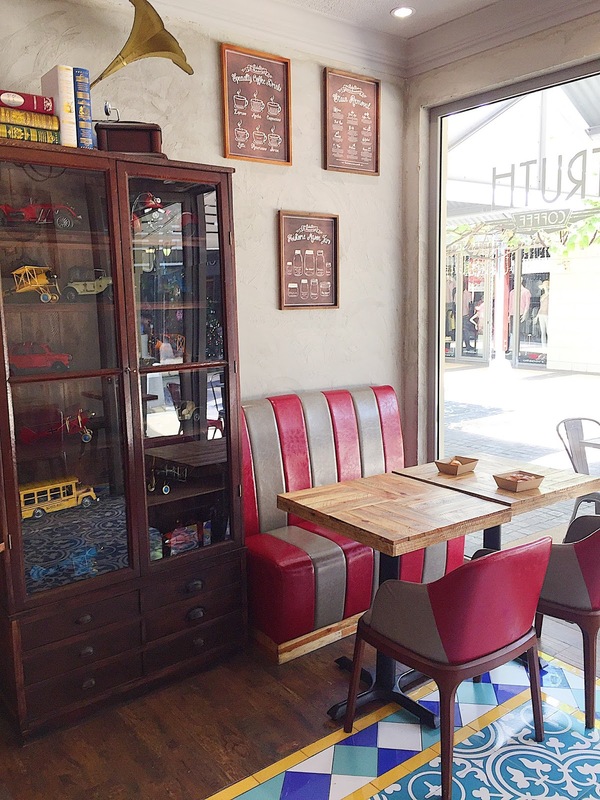 Click here to read more about coffee culture. I think Dim Sum is worth a try because Mauritius has a very special dish called the vegetarian Boulette that is made from Chou Chou or Chayote. Boulettes are dumplings served in different styles. Chayote is a gourd plant that has anti-inflammatory properties. It tasted nice and since this is a Mauritius speciality, you should try to eat one. I have to tell you the story about Mine Frite. Before I went to Mauritius, I was checking out Youtube videos and websites on local food. Many of them mentioned Mine Frite as a Mauritius specialty so I was thinking it might be fried in some special Mauritius sauce. No. It was really just fried noodles. If you are a Singaporean, I would not recommend it. I must mention Seven Pizzas. I tried twice and both times, I was very satisfied. It looked dimly lit but it serves amazing pizzas. The cheese was awesome. Everything went very well together. I am very happy that it has a 5 stars (upon 5) review online! Truly deserves it! This was my first time trying Ayurvedic massage that involved the pouring of warm oil all over my head and body. I liked the sensation of the warm oil and the gentle strokes. I could smell the fragrance of coconut oil. After my first experience, my scalp was rejuvenated. When I tried it the second time, I fell into a deep rest. 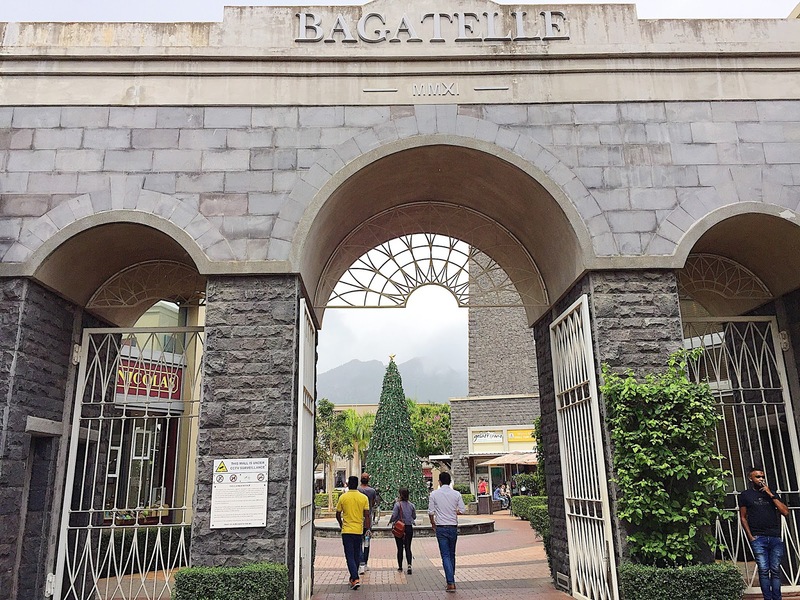 Bagatelle is the leading Mall of Mauritius, carrying big brands like Hugo Boss to local brands like Citadel. I purchased a Cold Shoulder Lace Navy Blouse from Citadel for around S$40 and some cosmetics from Bottega Verde. 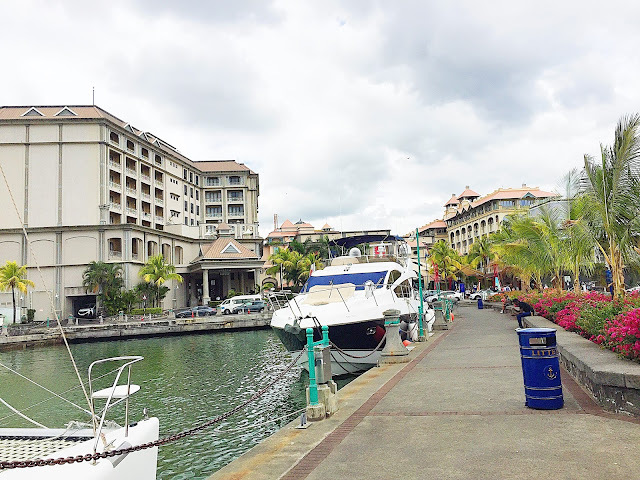 Port Louis is the capital city of Mauritius. 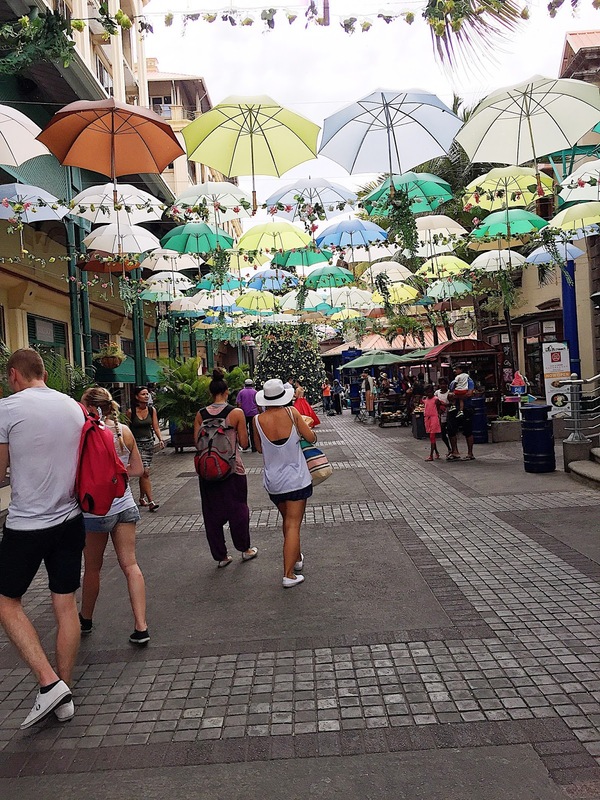 I visited Le Caudan Waterfront. I love the feel of Caudan because it was very colourful and cheery. The architecture was very unique. There were umbrellas hanging in the air, which I thought was cute. There was a very majestic and luxurious looking hotel situated right at Caudan - Le labourdonnais. When I walked past The Post Box - a lounge bar that overlooks the waterfront, I could not help but notice the charm and romance that it exuded. It was raining so I did not take many pictures of Caudan. For travellers who have to buy souvenirs for their family and friends, there are stalls selling craft, key chains, magnets, paintings etc. Many souvenirs portray the extinct Dodo bird. Do you know that Dodo bird existed in Mauritius? 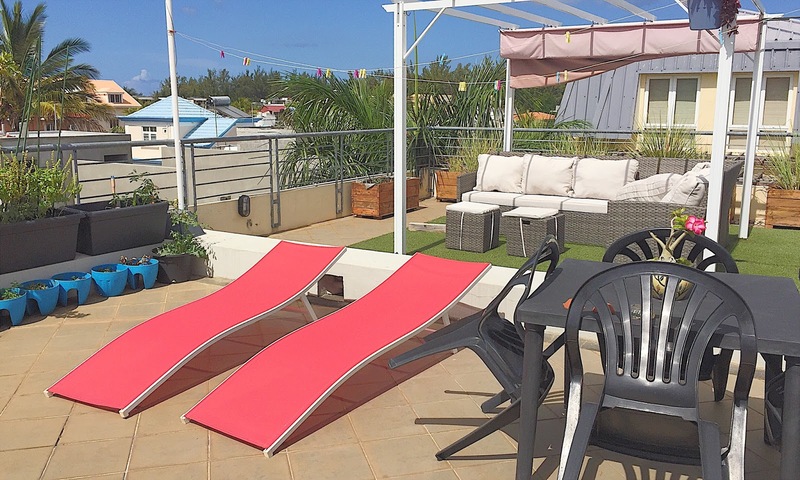 Stay in an apartment near the beach. 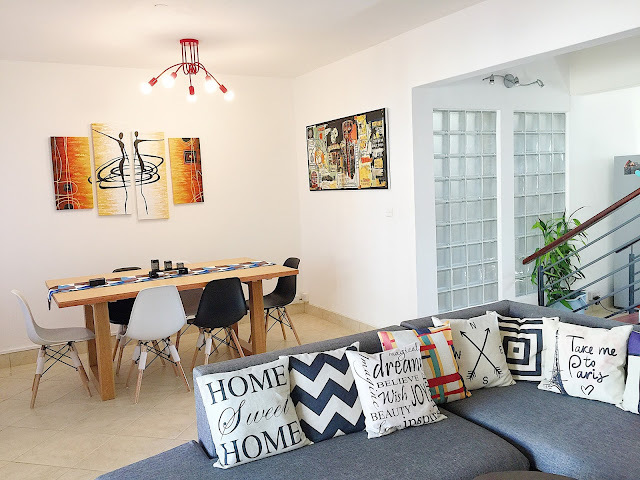 I stayed in a 2 storey apartment located at Flic en Flac. To check out more pictures, click here. For a Singaporean earning an average income with friends also earning an average income, this was the first time I saw such a big rooftop garden that was well put together. The beauty of staying in an apartment is that sometimes you can prepare your own meals. 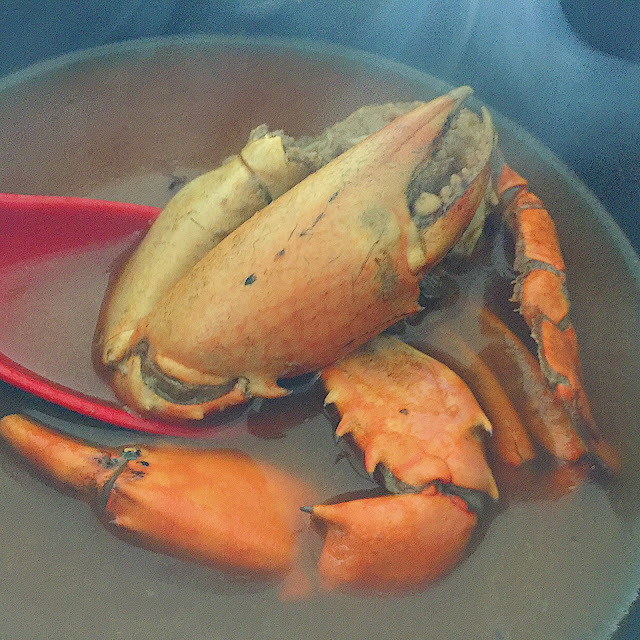 The crab soup was made using a pressure cooker and the aroma of crabs cooking permeated the air, filling me with warmth. I always want to get a pressure cooker because it is such a Masterchef thing! I watch only the Australia version faithfully. The U.S. one was too bitchy. You should watch the China version to have a good laugh. The chicken was bought from a nearby supermarket. It was quite tasty. Again, click here for more pictures of where I stayed. 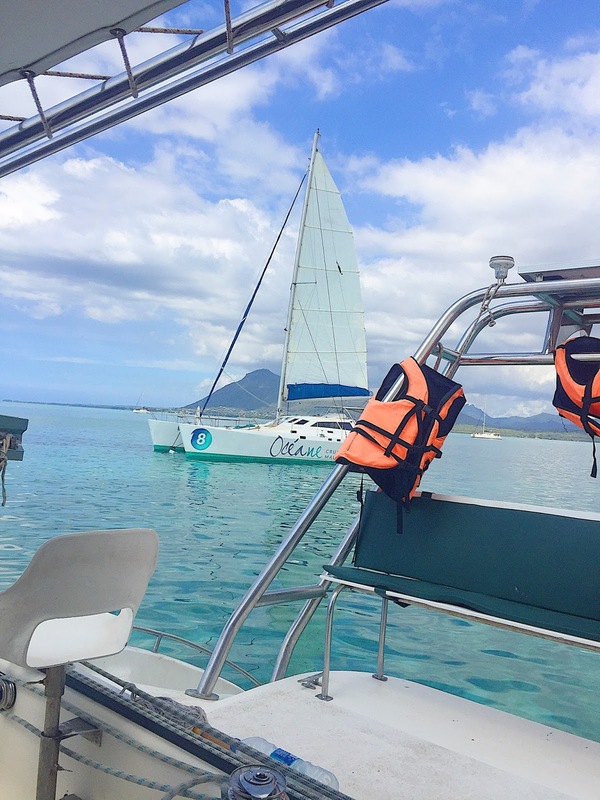 Go for a Catamaran Cruise. A catamaran is a watercraft with sails. It is not as fast as a speedboat and not as bumpy. 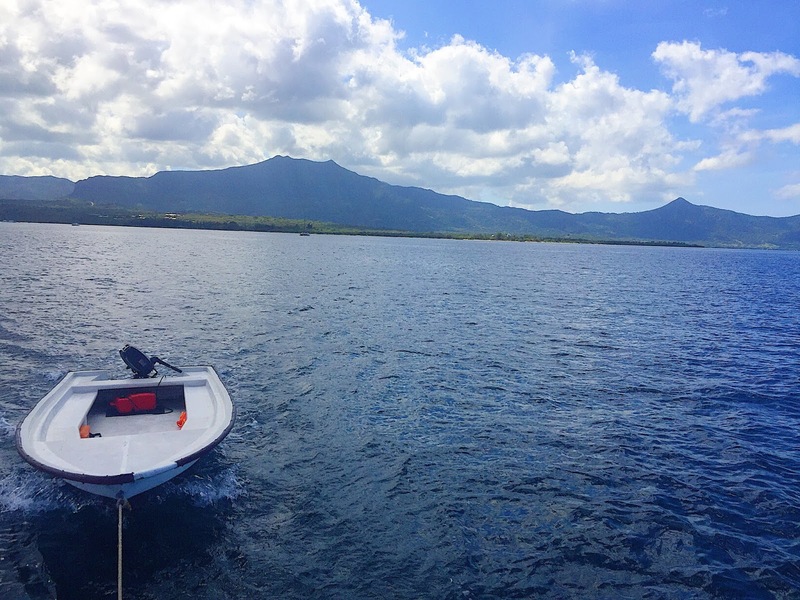 I went on a cruise that took me snorkelling, having barbecued food, finding dolphins, visiting Crystal Rock and Benitiers Island. I definitely recommend a Catamaran Cruise not because of the activities mentioned but simply because the beautiful vast ocean took my breath away. 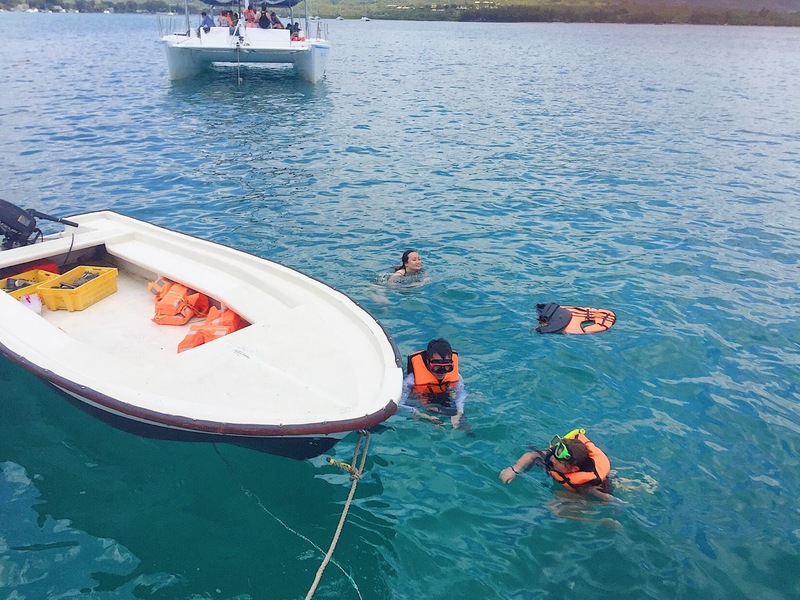 This is how a catamaran looks like. I was busy fixing my waterproof bag that would protect my iPhone 6plus when I went snorkelling. It was a gift from my sister so I wanted to make her proud by taking a decent photo of the fishes. Alas! The waterproof bag did its job well but I realised that it was so difficult to take a photo underwater because it was very dark! iPhone 6plus did very badly in low light conditions. I saw many silver fishes. The swim was good. We did not find any dolphins. Just like Singapore has her Tiger beer, Mauritius produces Phoenix beer. Phoenix beer is smooth and not as bitter as Tiger beer. Why am I talking about beers? 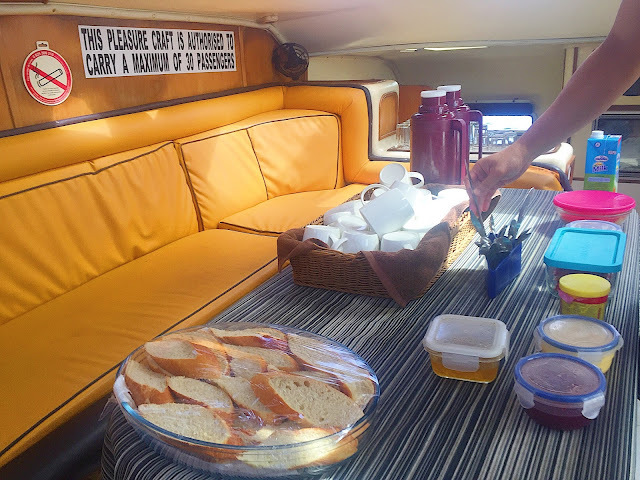 The Catamaran Cruise provides a free flow of alcoholic drinks. I also enjoy drinking rum with coke! I bought 6 small bottles of different types of rum at Mauritius airport. I made Rum Coke for my friends and they loved it! I enjoyed the cruise and I have some tips for you. Wear a very strong waterproof sunblock. Respect other cultures. 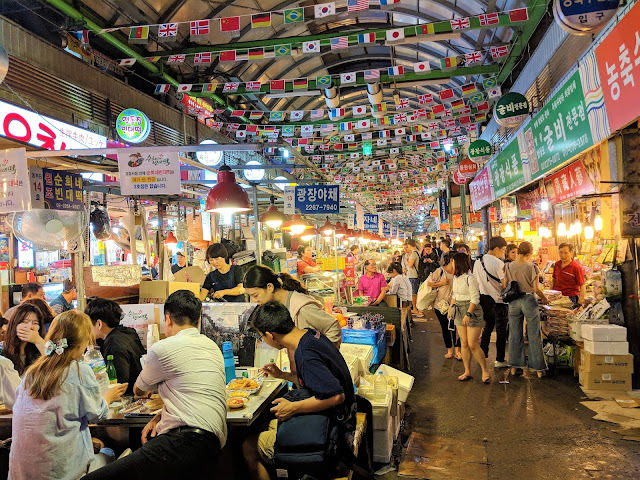 There was a tourist who attempted to take food from the table with his hands instead of using tongs and was halted sternly by the other tourists. Pack some snacks because lunch was the last meal on board. The duration inclusive of travelling on the road, was from 9ish in the morning to about 4pm. Overall, I enjoyed my short trip and I am very grateful for it. Then heaven must be a place filled with beautiful beaches, delicious food, warmth and is good for the soul.